Henry Brown, an African American, battled enslavement for a good portion of his life. When Henry was young, his family worked for a Caucasian master, who ended up shipping Henry away to work for the his son. After saying goodbye to his family, Henry was forced to work in a tobacco factory where the rules were strict. A few years later, Henry’s loneliness dissipated after he met a fellow slave named Nancy, who made his days a little brighter. They married, had children, and lived happily together until one day, while at the factory, Henry was informed that his wife and children were sold at the slave market. They disappeared from his life forever. Again, he was without a family. Fed up with years of slavery, Henry decided to escape from it. He, along with two others whom were willing to help, built a wooden box, addressed it to friends in Pennsylvania and shipped himself to freedom. After days of brutal transportation, Henry crawled out of the pried open box and found himself standing in front of four welcoming smiles. He was free at last. This book exemplifies element three because it targets injustice acts such as racism, slavery, discrimination, and oppression. Caucasian superiority was evident throughout the story, as it was during the time of enslavement. African Americans, often ripped apart from their families, were forced to obey their masters and work through their blood, sweat, and tears. Although there were a handful of Caucasians who fought against this social injustice during the time, as seen in the book, it was not enough to discontinue the segregation between races. The only way Henry escaped the tyranny was to put his life at risk and hope his final destination would be open fields of freedom. Issues such as slave versus master, minority versus majority, and inequality versus sovereignty were the most prominent throughout the story, which makes it a perfect example of social injustice. 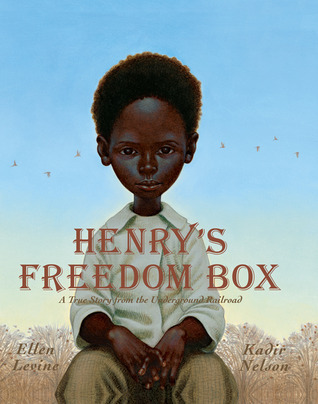 Before reading the book aloud, I would do an activity with my students to become familiar with their prior knowledge of slavery. After asking the students what they thought the title of the book represented, I would hand out a worksheet with three wooden boxes on it, one titled “Thing I know about slavery,” another titled “Things I want to know about slavery,” and the last box titled “Things I learned about slavery.” The first two boxes, things I know and want to know about slavery, would be filled out before the story was read. After I finished reading the story, I’d have students then write down in the last box what they have learned about slavery from the book. Afterwards, I would allow the students to color in the three boxes, encouraging them to share what they’ve written in their boxes with the students around them while they colored. Once the students were finished, we would come back together for an open discussion as a class, where I would then ask open-ended questions that went beyond the reading, such as “Why would saying thank you be a lie for Henry,” (pg. 6) “What do you think would have happened to Henry if someone caught him being mailed in the box?” (pg. 35) and “What do you think Henry will do now that he is free?” (pg. 38). These activities would not only allow me to assess my students, but it would widen their knowledge of slavery as well.